Imagine your boss with the head of a donkey, or your sister's legs on your brother's body. 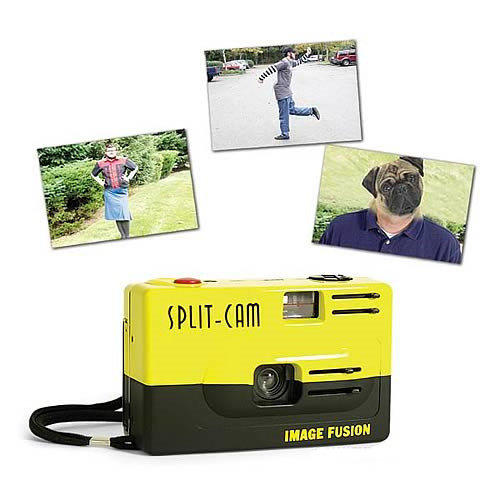 With the amazing Split-Cam, you can morph two photos together into all kinds of crazy combinations. Just use the crosshairs in the viewfinder and the lens-blocking sliders to line up two pictures that you want to be combined onto one print. You can even use it vertically to create the illusion of identical twins! Each 4 1/2-inches wide x 2 3/4-inches tall x 1 1/2-inches long plastic camera uses any standard 35mm film and has no flash. Instructions included. Clamshell blister with illustrated card. Order yours today!